Kee Safety has supplied and installed our safety systems on many petrochemical plants, our most recent being a roof edge fall protection system at a petrochemical company on Jurong Island in Singapore. In the petrochemical sector, durability, corrosion resistant materials and continuity of operations are vital. Kee Safety products help to meet all of these requirements. There are several health and safety issues to be concerned about when working in a warehouse or a factory. 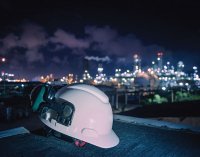 Kee Safety Singapore provides a range of products, which will separate staff from hazards, whether they are working internally or externally, at height or on the warehouse or factory floor. MOM has published the Singapore Workplace Safety & Health (WSH) Statistics Report 2018. According to the report, the fatal injury rate remained at the same level as the last year – at 1.2 per 100 000 people employed. MOM is going to conduct targeted inspections on companies with falls from height, slips, trips and falls and vehicular-related incident risks. 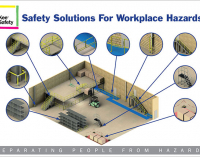 Companies should make sure that their staff is separated from hazards in the workplace. Kee Safety Singapore is proud to be a member of the Singapore Institution of Safety Officers (SISO). It proves our commitment to both meeting and providing the highest standards of service and health and safety. Kee Safety Singapore has expanded its KEE GATE self closing safety gates range and added full height ladder gates to its portfolio. All products from the KEE GATE safety gates range are CE marked and have been designed to make access to openings and restricted areas much safer. 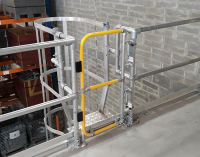 Kee Safety Singapore has expanded its range of safe access solutions for roof top walkways with the introduction of KEE WALK with Guardrail. 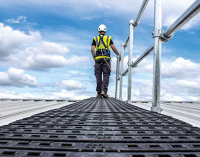 A cost effective and modular approach to guardrail protection, this system provides roofers, contractors and maintenance teams with a clear demarcation route to eliminate potential fall hazards.